Two more phalanx done. I hope tomorrow to get painted the fourth. Then base them and take a progress picture. I will put an order to newline design and buy a persian army to confront my greeks and macedonians. We're off to a late start but as vacation is coming up I'm not worried. No worries about a late start. At this rate I'm only going to get two marauder units done. 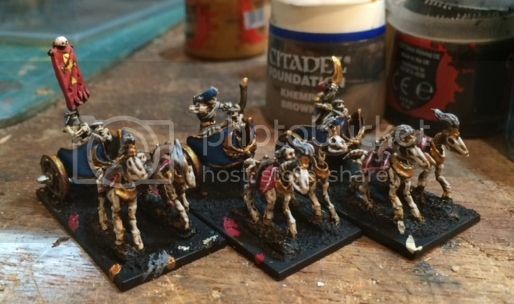 Almost done on my skeleton infantry and Polar Fox chariots.. The chariots are very nice models - I much prefer the chariot itself to the GW equivalent. But the horses' necks are worryingly narrow and I'm scared they'll snap off. 4 of the 5 towers modeled up and stained and the earthworks are mostly painted up. DryE good with work with the banner of the inf…. Super. Mr. Cjbennet nice scratch build sir. 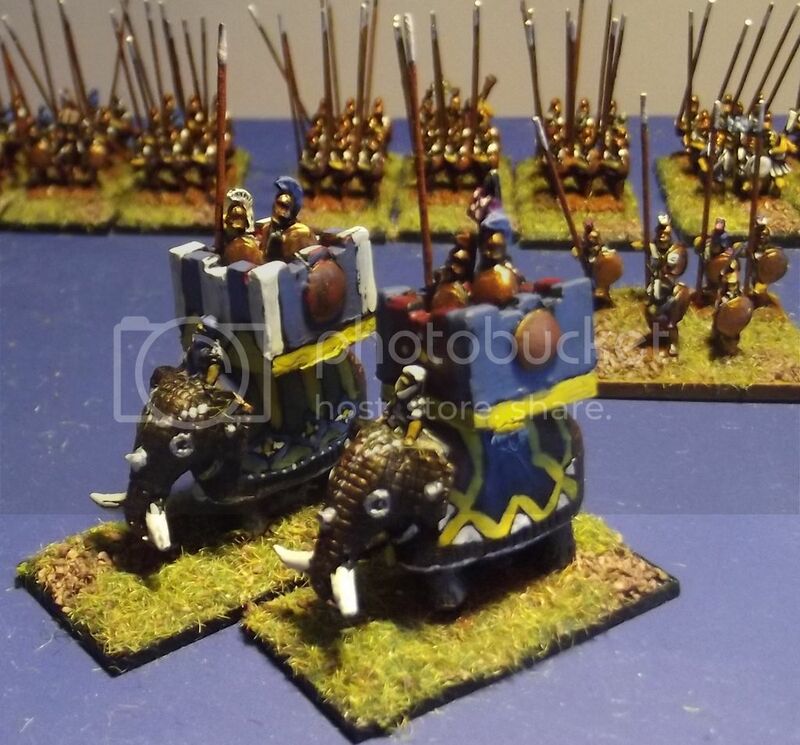 This month I am working hard to finish my succesor/macedonian army. I almost complete it. Here it is the shot of the advance until today. Thanks aquahog, they are from Irregular. I love them. So much flat surface where you can paint a scheme! no wrinckels or complicated deep detail. I am just painting fast, but enjoying every figure. No inks, no highlight. Well, for telling the truth, in the deep blue of the elephant textil I did a quick blending. Just tabletop painting. The orange banner on the side might be too big so I might trim it to be something else and I will do one other in a blue. need to keep the banners plain as the siege towers will be used by orcs and elves alike throughout their life. Going to a small tournament at Aquahogs place this weekend so at least I get some gamingtime! Ha ha fanatic cannons and confused goblins! You know those figures were originally meant to be to show confusion, hence the goblin pointing the gun the wrong way!